Tetsuya Miyamoto created KenKen in 2004. Twelve years later, millions of KenKen puzzles are solved every day by people all over the world. His original intent was not to create a global math sensation. Instead, he wanted to help his students improve their calculation skills, logical thinking, and persistence. Who knew that he would accomplish both? KenKen puzzles are perfect for the classroom because they provide the same level of practice and repetition — sometimes affectionately known as drill-and-kill — as a worksheet full of problems, yet providing a significantly higher level of engagement. write 300 as a product of 4 factors? write 40 as a product of 4 factors? write 13 as a sum of 5 numbers? write 12 as a sum of 4 numbers? write 5 as a quotient of 2 numbers? 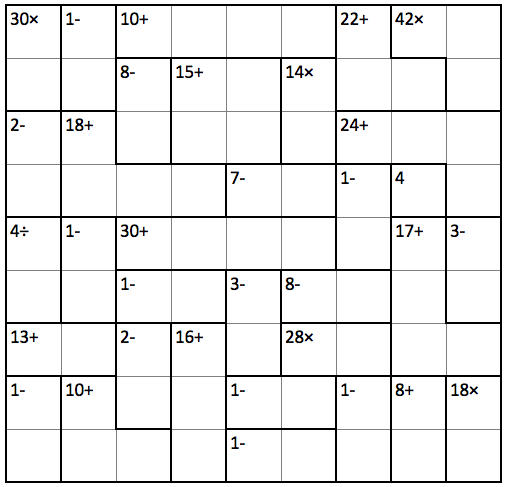 Yet wouldn’t students be willing to at least try this 5 × 5 KenKen puzzle? The cognitive demand is the same, but as any marketing guru or parent trying to get their kids to eat vegetables will tell you, it’s all about the presentation. Because of the puzzle’s appeal and impact for students, the KenKen in the Classroom program was created. 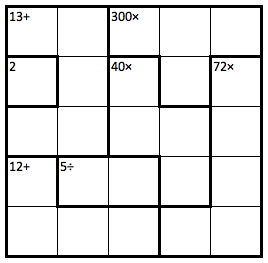 Every Friday, teachers who’ve signed up will receive free puzzles, which can be printed for distribution to students. KenKen puzzles deal with a lot of mathematics beyond the four binary operations, including factors, parity, symmetry, modular arithmetic, congruence, isomorphism, algebraic thinking, and problem solving. Harold Reiter, John Thornton, and I wrote about these topics and how to use KenKen in a secondary classroom in the article Using KenKen to Build Reasoning Skills. Even better than solving KenKen puzzles, though, is having students design their own. 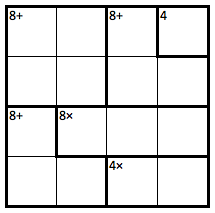 And to that very point… the 5 × 5 puzzle that appears above was created by my son Alex when he was 6 years old. I hope you’ve enjoyed reading this week of KenKen posts as much as I’ve enjoyed writing them. I’d love to hear your opinion of the series. Definitely check out the other items in this series with the links at the top of this post, and share your thoughts on all of them in the comments. Well, here it is, September 25, a mere 269 days into the year, and I am only now presenting you with a KenKen puzzle based on the year. I suppose I can take some solace in the fact that I’m presenting the following 2016 KenKen puzzle before the year is over. Little victories. The numbers 2, 0, 1, and 6 are featured prominently as individual cells. Every target number uses (some combination of) the digits 2, 0, 1, and 6. There are two large cages — one in the shape of a 1, the other in the shape of a 6 — each with a product of 2016. 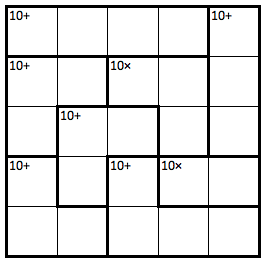 If you’re stuck, just fill in the squares randomly. 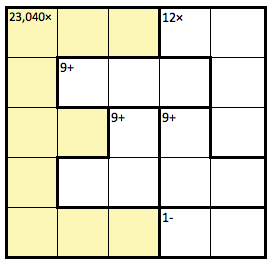 There are only 108,776,032,459,082,956,800 different Latin squares of size 8 × 8, and your chances of guessing correctly are even better since 4 cells are already filled in. 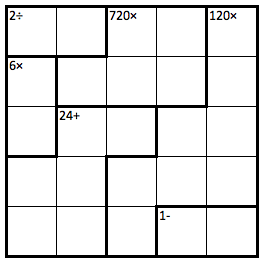 As is typical of all puzzles presented on this blog, I am not posting the solution. At least, not yet. Maybe someday. If you beg. Or send me money. But not today. Robert F. Fuhrer is a toy inventor with a knack for coming up with creative names, including Crocodile Dentist, Gator Golf, T.H.I.N.G.S. (Totally Hilarious, Incredibly Neat Games of Skill), Rumble Bugs, Missile Toe (literally, a rocket in the shape of a toe), and many others. As the president of Nextoy, LLC, which holds the registered trademark for KenKen®, Bob now uses his creative naming abilities for the appellations of KenKen-related products. The word that started this post, KENgratulations, is just one of his many linguistic creations. I rather like the term he coined to describe the computer application that randomly generates KenKen puzzles. Quick! 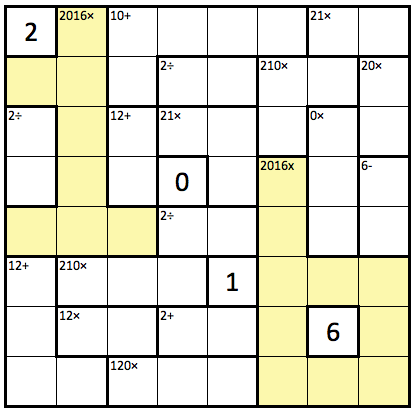 We need more 6 × 6 puzzles. Crank up the Kenerator! The name conjures images of a machine from Willy Wonka. Numbers and operations go in, puzzles come out. I prefer kencils rather than pens when solving KenKen puzzles. Kengratulations for solving that puzzle in less than 7 years! 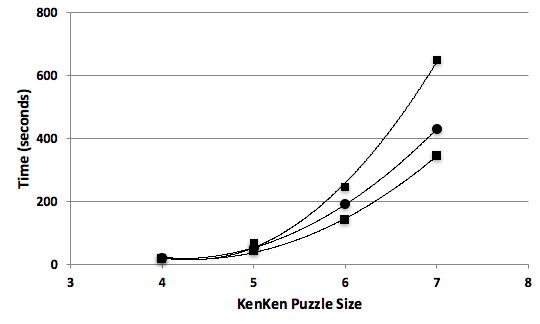 Most Kenthusiasts solve more than one KenKen puzzle a day. I complete a Kentathlon consisting of a 4 × 4, 5 × 5, and 6 × 6 puzzle every morning. He’s completely egokentric, even though he’s never won a KenKen tournament. The Kenerator resides in the kentral office. He became instantly addicted to KenKen puzzles; he became a kentenarian in less than 3 weeks. She became a superkentenarian by completing all the puzzles in Ferocious KenKen on Saturday. Enter the kentagon, prepare to solve! Kenthusiasts who have entered kenopause usually solve fewer than one puzzle a day, on average. If you copy off your neighbor at a KenKen tournament, you’ll be sent to the kenitentiary. Harold Reiter’s interest in KenKen started long before the Kenaissance. He’s such a kenderfoot; he doesn’t even know the X-wing strategy! He has a kendency to complete all of the addition cages before attempting any subtraction cage. At the 2013 KenKen International Championship, she started to hyperkentilate when she had trouble with a difficult 6 × 6 puzzle. 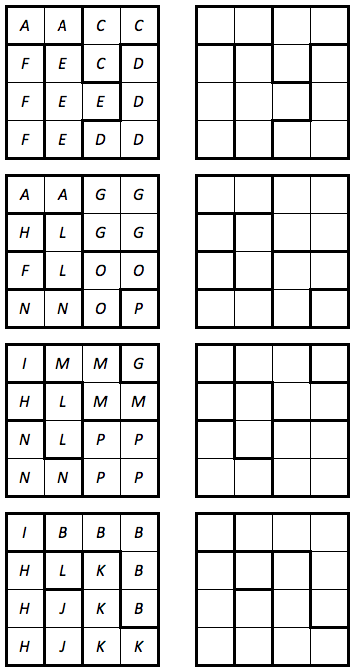 Like Thomas Snyder, Harold Reiter believes that human-generated KenKen puzzles are superior to those created by computer. But Harold pushes the envelope by developing variations on KenKen that include Primal KenKen, 3-D KenKen, n × n KenKen puzzles that use numbers other than 1‑n, and Clueless KenKen — which contain no clues and, contrary to popular belief, were not invented by Cher Horowitz. Recently, in fact, he sent me a No-Op KenKen puzzle that used the floor function. 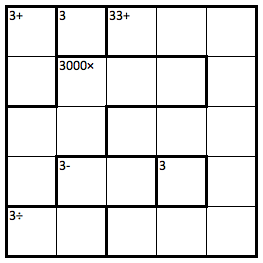 The following standard KenKen puzzle is one of Harold’s “Big Letter” puzzles. One of the cages forms a capital E, and he made this puzzle for a friend whose name began with — wait for it — the letter E.
No-Op KenKen Puzzles have target numbers in the cages but no operations. 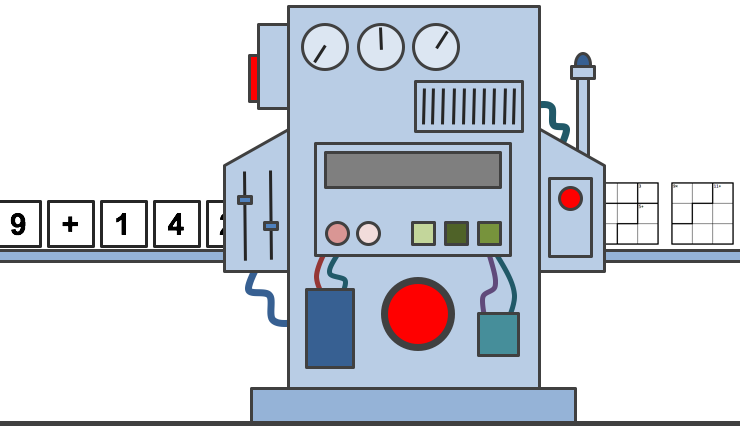 All the typical rules of KenKen apply, but it’ll take a little more thought to determine which operation is needed in each cage. 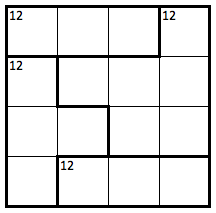 The following is Harold’s “No-Op 12” puzzle. In the puzzle below, there are 48 lines. Each must contain exactly one of the digits 1, 2, 3, and 4. The 16 cages are identified by letters. Each cage is either additive or multiplicative, and the target number for every cage is 12 — meaning that the numbers in the cells of every cage either add or multiply to give 12. Ken you solve it? This one might need a little more explanation. 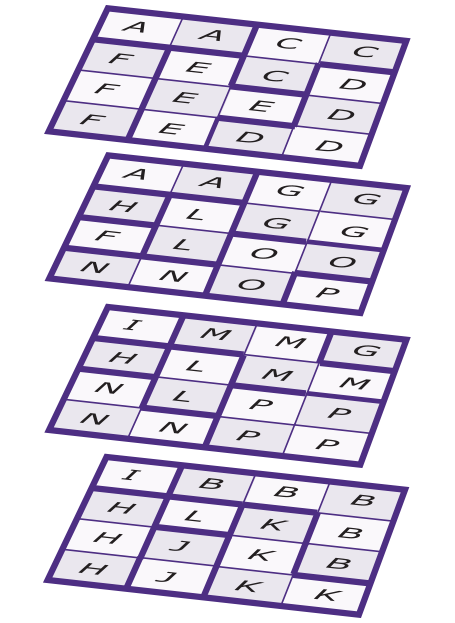 The four layers of the puzzle work together; for instance, the two A’s on the top layer and the two A’s on the second layer form a four-number cage with a target number of 12. Similarly, the four G’s on the second layer and the lone G in the third layer form a five-number cage with a target number of 12. All standard KenKen rules apply and are extended to three dimensions — no repeat of a digit in any row, column, or tube vector. 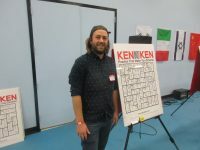 The KenKen world is indebted to Harold for creating interesting puzzles and for sharing them with a new generation of students at his local math events. For more of Harold’s puzzles, and for suggestions on how to create your own, check out KenKen, Thinking Globally.